During the Great Plague of 1666, Newton was forced to go home for a holiday when schools closed in London. While idling under a tree, he got the basic idea for his Theory of Universal Gravitation. During the heyday of telephone exploitation (1877), Alexander Graham Bell got married and took a yearlong honeymoon in Europe! While there, he had his grand vision—not for the telephone, but for the telephone system. So much for not being able to leave a project for vacation! As your powers as a change artist grow, it's easy to get the grandiose idea that the world can't change without you. This challenge is a challenge to that idea. It's also a way to trick you into taking care of yourself. Your challenge is to take a week away from work, and when you get back, notice what changed without you being there. You must not do anything about your change artist work for a whole week, but notice what thoughts come into your head, or what apples fall on it. Do you think you can't do this? Then you have a different assignment, suggested by Wayne Bailey: "If you're going on a week-long vacation and feel the project cannot do without you, then take a two-week vacation." 1. We took two weeks and went to Hawaii. It was our first vacation in seven years—really since our honeymoon. I'd always dreamed of a Pacific island paradise, and we found it. The first few days, Shanna and I drove all over the Big Island like tourists. It was interesting, but it wasn't the vacation of my dreams. Then we just starting frolicking on the beach, eating, laying about in the shade, eating, really talking to each other, eating, swimming, and eating. After about seven days of this bliss, I woke up early one morning and realized that though I hadn't consciously thought about work at all, I suddenly had a complete vision of how our process improvement program had to be restructured. Shanna was still asleep (it was real early), so I slipped out for a walk on the beach. When I got back about two hours later, I had the entire thing worked out in my mind. I didn't even have to write it down—it was so clear that I knew I couldn't forget it. Then I put it out of my mind and enjoyed the last three days of our vacation in paradise. When I got back to work, I had a new and revitalized organization. More important, I had a new and revitalized marriage. 2. I decided to spend a week hiking a segment of the Appalachian Trail. I hadn't done any backpacking for a couple of years, so I had to take out all my equipment, replace some of it, and reconsider everything. While doing that, I realized that I needed to do the same thing at work. I was so eager to get started that a little voice inside me said to forget the hike and get back to work. But I resisted. I was able to use the hike—even though it rained most of the time—as a metaphor for the changes I had to make at work. Come to think of it, that was probably because it rained all the time. 3. I stayed home and played solitaire, did jigsaw puzzles, and cleaned the house. I also rearranged my thoughts. Thank you for this assignment. 4. I went to Spain, where I could refresh my school Spanish. I spent a week in Madrid and a week in Barcelona, with a few side trips into the country. Perhaps it was living in another language for two weeks, but I didn't think of work at all. When I came back, I discovered that they had gotten along very well without me, and were eager to show me some of the nifty things they'd accomplished. At first I was depressed, thinking that I wasn't as essential as I had thought. Then I was elated when I realized that I had done a good job of preparing them to keep improving things when I wasn't there. I guess that's really the change artist's job, isn't it. 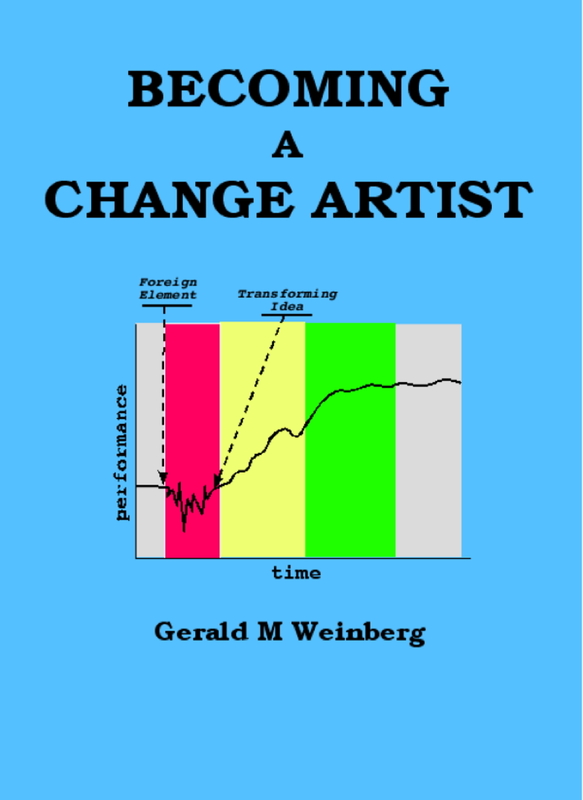 These challenges are adapted from my ebook, Becoming a Change Artist, which can be obtained from most of the popular ebook vendors. See my website <http://www.geraldmweinberg.com> for links to all of my books at the major vendors. Size Does Matter in Space! What's Wrong with Agents as Publishers?